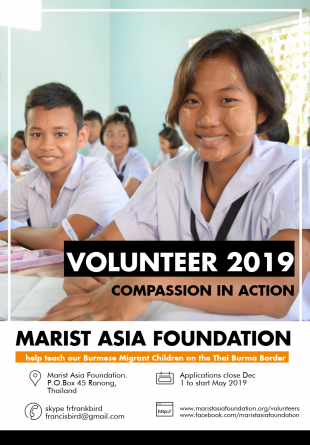 Marist Asia Foundation welcomes Volunteers who come for 6, 12, 24 months and visitors who stay for a short time to help in our programmes in many ways. Volunteer opportunities are open now for 2019. Due to immigration and legal documentation to be a volunteer in Thailand preference now is given to volunteers who can come for a period of at least 6 months. Each year we require 2-3 volunteers who can help in our English and Social Studies classes. Qualified Teachers are also able to help with teacher mentoring and training. Step 1 make contact. Step 2 complete application forms. Step 3 Skype conversation. Step 4. Letter of acceptance. Click on the advertisement below to download and share with some of the stories below of our Volunteers and Visitors.